to him of comfort and hope. And as she sang the blood flowed quicker and quicker in the Emperor's weak limbs, and life began to return.
' You have done that already !' said the Nightingale. ' I brought tears to your eyes the first time I sang. I shall never forget that. They are jewels that rejoice a singer's heart. But now sleep and get strong again; I will sing you a lullaby.' And the Emperor fell into a deep, calm sleep as she sang. The sun was shining through the window when he awoke, strong and well. None of his servants had come back yet, for they thought he was dead. 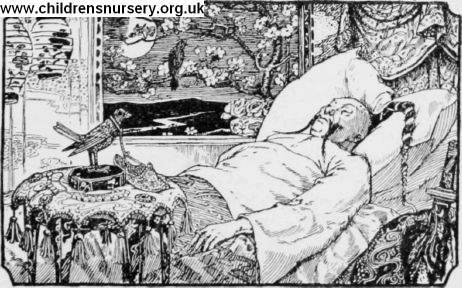 But the Nightingale sat and sang to him.